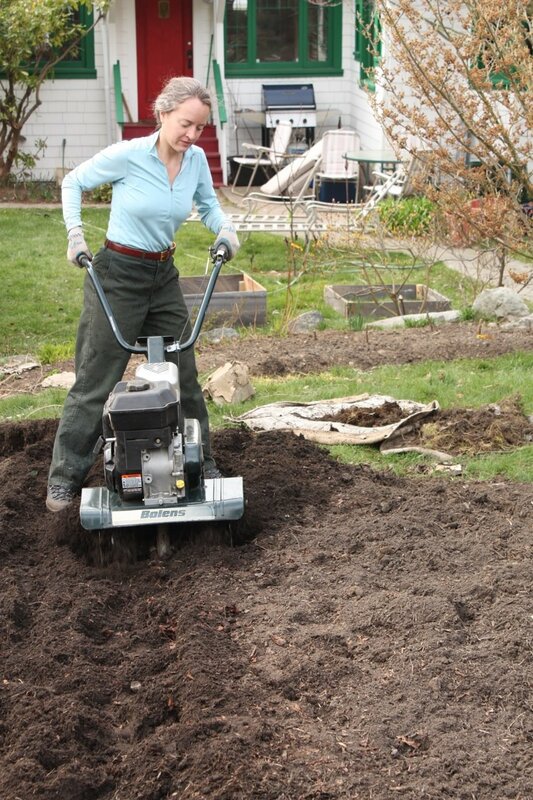 There are lots of ways to start a new vegetable garden; removing sod, rotting sod, bringing in new soil, and the ‘lasagna method’. I read about them all. And, in the end, I did them all. First though, I tried the easiest: the lasagna method. For a lasagna garden, you create a raised bed by layering organic matter that decomposes over the winter. 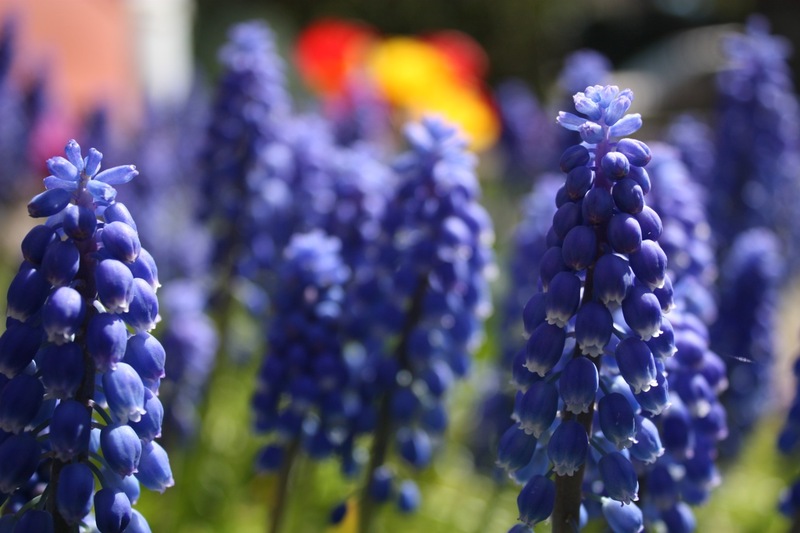 By spring, you should be able to dig into the top mulch and plant directly into nice composted soil. Or so the story goes. Upon the beautiful grass, I laid cardboard from our moving boxes, and followed that with layers of fall leaves, kitchen scraps, and some enriched soil from my inherited compost pile. Then I ran out of material. 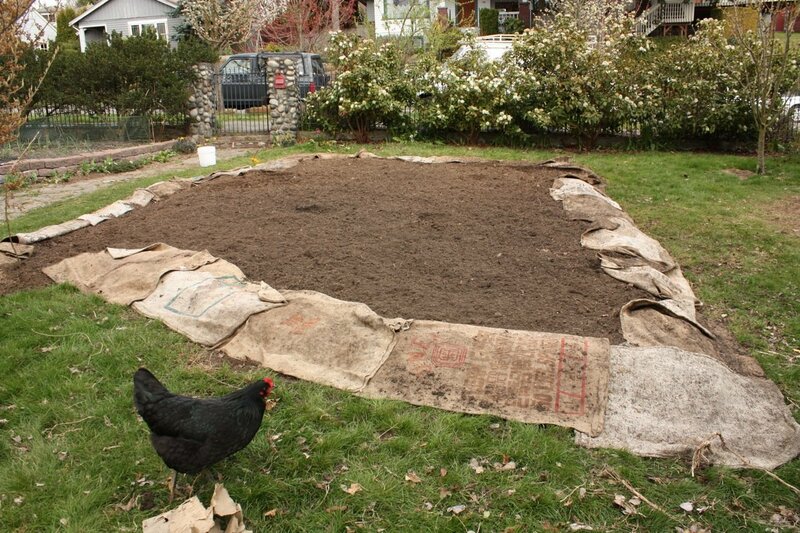 I covered the whole area with burlap bags from the local coffee joint, crossed my fingers, and waited until spring. March 1st, I ordered 4 yds of topsoil/compost and spread a good 4” on top of my half-baked version of a lasagna. Now THAT was looking nice! At the beginning of April, I decided it was time to plant. The gardening method I am trying this year is the ‘WORD’ system (Wide rows, Organic methods, Raised beds, Deep soils in ‘The Vegetable Gardener’s BIBLE’). In addition to raising beds by adding the soil from dug paths between the wide beds, author Ed Smith recommends loosening the subsoil. 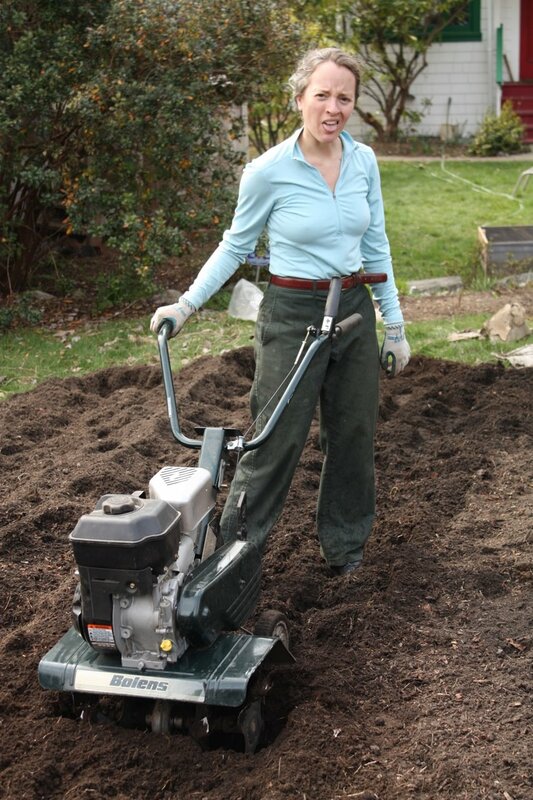 When I tried this, my shovel found last fall’s sod still intact. Damn – I was going to have to remove the sod after all. Much to the delight of the chickens, who nabbed every worm and grub I turned up, I started hand digging the partially-decomposed sod. Aie, my aching back! It wasn’t long before I agreed to Scott’s suggestion and borrowed neighbour Matt’s rototiller to finish the job. Hard work even then! I removed the hunks of decomposing sod that would chatter to the surface, and finally had nice, deep soils that were starting to look and feel like ‘garden’. As per Ed’s Bible, I marked out rows 3-4’ wide with 1.5’ wide paths between them. Using guide lines, I dug the footpaths, placing the soil on top of the beds, then raked the beds flat. My garden area slopes south and west, so contouring would have been a good idea. But I laid out the rectangle before considering the incline, so when raking the beds flat I tried to compensate by leveling them somewhat. Finally, I laid down newspaper (4-6 layers) and straw on my footpaths, which hopefully will prevent any remaining sod from regrowing. Voila! 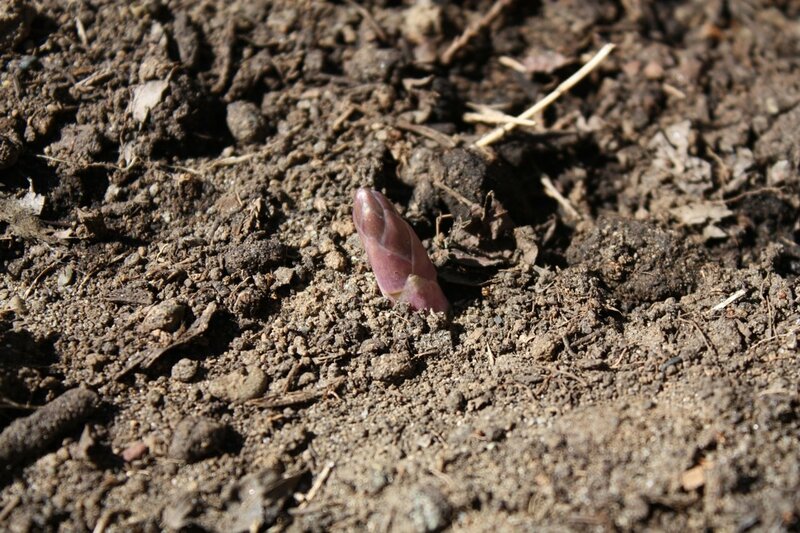 One lone spear of asparagus has emerged from the scrawny octopi that came labeled as asparagus crowns 3 weeks ago. Hopefully more will follow. I’ve planted peas, cabbages, carrots, kale, fennel, parsnips, and onions. Marigolds, nasturtiums, and dill were sown at the bed ends to encourage beneficial insects. And so it has begun! Every day a new adventure! 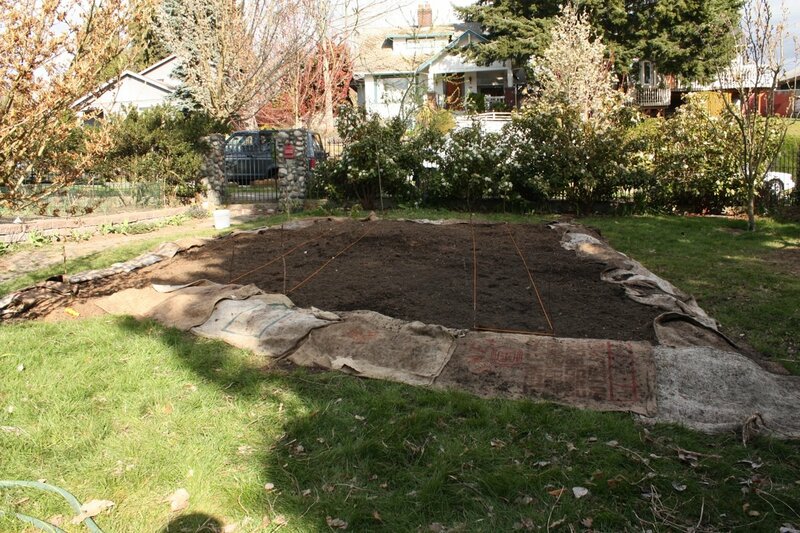 This entry was posted in DIY, vegetable garden. Bookmark the permalink. I think I’ll try wide rows this year, too. 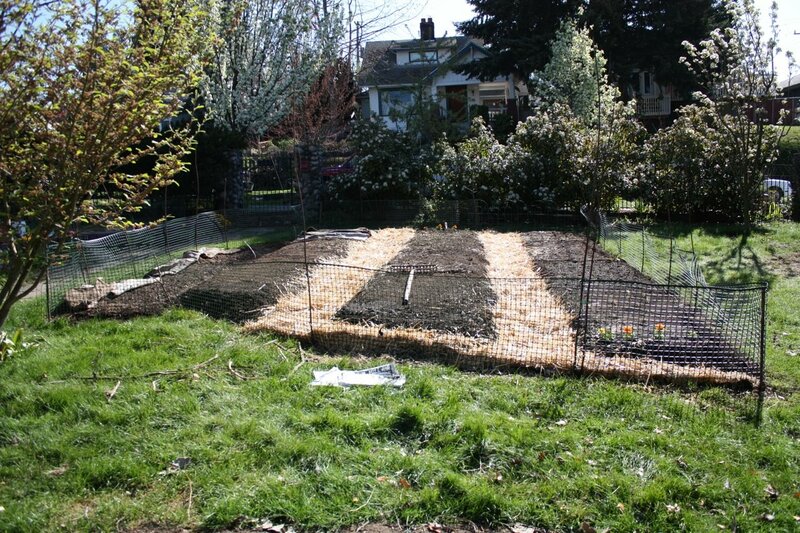 I’m also going to try a raised bed for my gourds and peppers – they never seem to ripen before the frost. 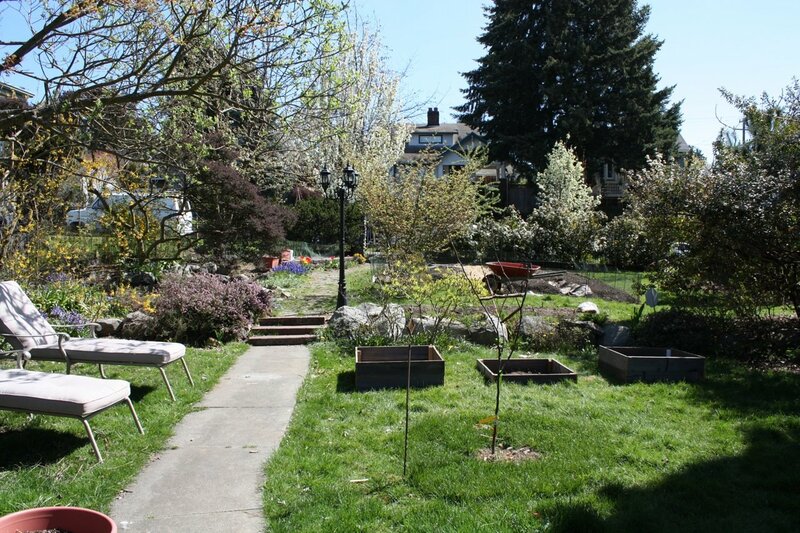 I think also that I’ll have to give up the ghost on simple adding compost to the garden on a rotational basis and order some actual soil – might do better than the strait sand I’m diggin in now! Man, everything you just did, I’m going to have to do in a few weeks – eek! wrt ‘hot’ plants, you could try extending the season by warming up the soil and starting them under a row cover, then using the row cover in the fall to keep them going a bit longer. Neighbour Willi (www.digginfood.com) is doing that this year – some black sheet-y thing over the soil to warm it before planting. I’m thinking about it too. I’m starting peppers inside. Wanted to start squashes too, but they recommend not planting out squashes.